Dr Robert Kreiter, ECN, Netherlands, was the recipient in the category ‘product or product oriented R&D’. The co-recipient, in the category ‘fundamentals of Sol-Gel’, was Dr Paolo Falcaro of CSIRO, Australia. 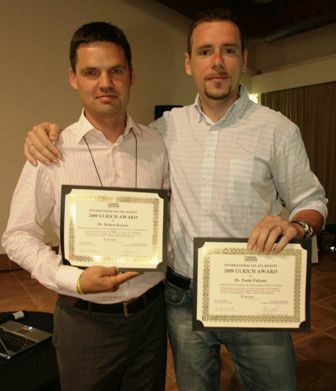 The awards were handed jointly over by Prof K. Nakanishi on behalf of the International Sol-Gel Society and by Dr J. Parker, Springer executive editor, in Porto de Galinhas, Brazil during the International Sol-Gel Conference on 27 August 2009. Dr Robert Kreiter is working as Scientist and project leader in the Membrane Technology group at Energy research Centre of the Netherlands (ECN) since 2005. Sol-gel chemistry and hybrid materials are among his main interests. He was strongly involved in the development of HybSi® membranes from the start and currently coordinates materials research on hybrid silica membranes and materials. Present affiliation and contact information. Dr Paolo Falcaro has been awarded for his outstanding contribution to sol-gel science and technology in the “basic and applied science” category. His research work focused mainly on the study of templated self-assembled mesostructured materials, and more specifically, their applications as dip coated thin films. He graduated from University of Padua, Italy, and continued working there to obtain his Ph.D degree in 2005 under the supervision of Professors Plinio Innocenzi and Massimo Guglielmi. After that he worked at CIVEN, Italy and recently moved to the Australia’s Commonwealth Scientific and Industrial Research Organisation (CISRO).